Hand forged of genuine high-carbon Damascus steel by artisan sword makers, this Ten Ryu katana offers a massive 27" blade with a hand-sharpened edge that will slice with ninja precision. 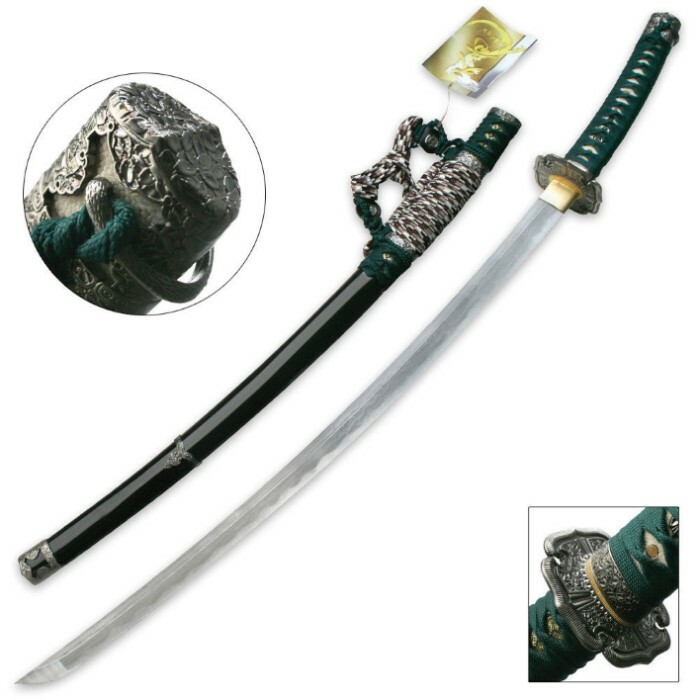 Stylish embellishments such as the cast Sakura tsuba, brass accents, genuine ray skin handle and regal green cord wrappings add tons of authenticity to this dramatic, fully functional collectible sword. The lacquered scabbard is hand painted and adorned with coordinating cord accents and attractive hardware. 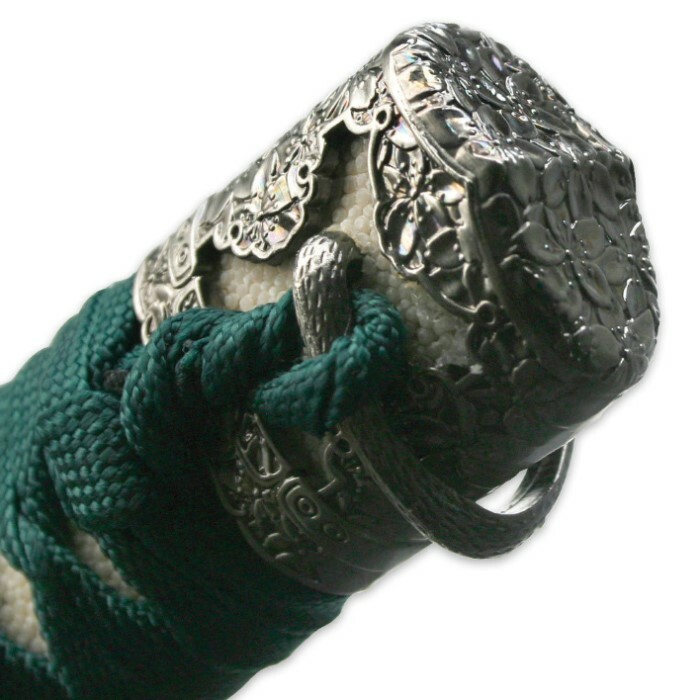 All of these exquisite elements culminate in a show-stopping masterpiece that will be treasured by true sword collectors for generations. The quality at this price is absolutely stunning. It makes me wonder why there are swords at 4x the price, but of the same quality. The sword is completely solid and the blade came very sharp. I would definitely recommend this to anyone. Just got this sword yesterday, and I'm beyond satisfied. It has a nice weight to it, the blade is super strong and sharp, and I love the pattern on the blade. Nothing bad about it. 5 out of 5. When I received this sword it came just as i expected. The blade is very strong and sharp! I've cut everything from rolled up carpet to old punching bags and the blade still remains incredibly sharp. Not to mention the blade has not gained a scratch sense i bought it. 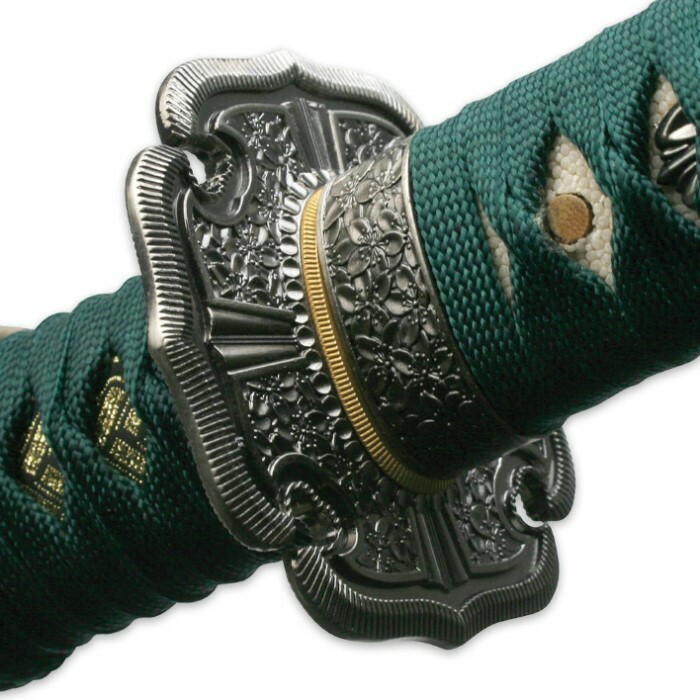 It was wonderfully forged and i highly recomend this blade to any swordsman who is in the market for a good sword! I bought this katana and had no problems with it. It came very well sharpened and polished and had no effects. Ten Ryu is definitely a respected brand in my book. I highly recommend it!